← Ballet Squid Quickie: U of L Dance at Iroquois Amphitheater! I feel that I was, well, very squidly in the middly today — like there were no bones between my pelvis and my shoulders. Last night, I went running. Or, well, it started out as running. The goal was to run to the RedBox at ValuMarket, retrieve two movies, and run home — only I discovered that, after about six months back in the ballet studio, my feet have reshaped themselves enough to change how my running shoes fit. The Minouras are still comfortable, don’t get me wrong — but I can no longer wear them without socks! 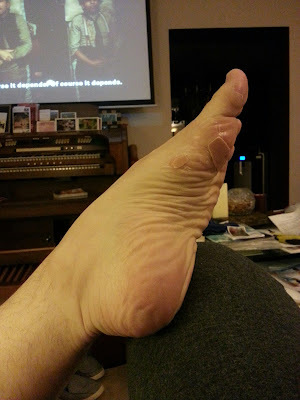 I gave myself a bunch of blisters — not the biggest ones I’ve ever had, and not the worst ones I’ve ever had, but there were a lot of them, and dancing on burst blisters is no fun. Walking home kept them from bursting and peeling, which made class much, much more comfortable this morning than it might have been. you can only see two at this angle. Also, look — I have ankles now! Anyway, I ran the outbound leg of my trip and walked back, then stuck fancy bandages all over my feet while we watched two movies (Grand Budapest Hotel, which was very lovely, and The Lego Movie, which was actually better than I expected it to be). I arrived home at 8:25 PM. Needless to say, we stayed up later than we should have. Staying up late meant taking my sleep aid even later, and I was still feeling it this morning during class. I felt a touch groggy, a bit slow, and like I was having a hard time keeping everything pulled together*. That said, I think that working through the fog is a good lesson in and of itself. Say I actually get a chance to perform some day: there are going to be days that rehearsals happen when I’m feeling groggy and not entirely with it. Likewise, if I work in Dance/Movement Therapy, there are going to be days that I’ll need to be in the studio and “on” even though I haven’t slept well or whatever. As dancers, we have to learn how to work through grogginess and harness every scrap of focus we can find. Going across the floor, I felt like all that focus-retrieving effort paid off: while I didn’t feel like my sautés and leaps were exactly spectacular, I was able to get my arms in sync. This was an improvement over the beginning of barre, during which I couldn’t seem to remember what my arms were supposed to do at all. I also managed one or two decent pirouettes (which we did before clearing the bars). Margie gave me a couple of excellent corrections that amounted to: pay attention to when and where the working knee arrives in passé and let your shoulders carry your head (or, don’t lead with your neck!)**. Denis said I looked really good going across the floor, which was nice. I tend to focus hard on my faults and I don’t always appreciate what I do well. Instead of seeing a grand jeté that looks pretty nice, I see one that doesn’t look perfect. C’est la vie. Probably the highlight of today’s class, though, was really feeling and using the music — bizarrely enough, this happened during our barre stretch. I feel like I’ve got the basics back in my body enough to start working on musicality and interpretation more, especially during our Essentials class. In the advanced beginner and beginner/intermediate classes, I still feel like I’m focusing on getting the steps back into my body. I hope I’ll be able to keep the glissades turned on. The glissade-assemblé mental block still surfaces from time to time, so I practice glissade-assemblé at home all the time now in an effort to correct it. For what it’s worth: different teachers and different dancers have different feelings about practicing at home. I find it works well for me. I’ve very much a kinaesthetic learner, though: my body leads my mind, rather than vice-versa (in short, I don’t think too well when I’m sitting still!). As such, I rely on a process of successive approximations followed by increasing refinement … which is to say, I learn faster if I repeat things a lot. If I leave the studio feeling like I don’t have the first layer of approximation solidly modeled (a good mental 3D “video” coupled to a basic kinesthetic understanding), I won’t generally practice a given movement outside of class. Once I have that first layer down, though, I am pretty good at building upon it without adding errors. This usually means that I’ll give something at least a couple of classes before I start working on it at home. There are some steps I can’t practice at home (no room for tour jeté in the house — upstairs, there’s too much furniture; downstairs, I’d smack my arms on the ceiling; outside, our yard is way, way too un-level), but I seem to be good at improving the steps I can practice. I will say that two classes per week plus some practice at home doesn’t work as well as three plus some practice at home. I’m sure four or five classes per week would be awesome, but it’s not in the budget right now. I don’t think everyone necessarily should practice at home (and I might not bother if I was taking class five or six days per week). I think it’s up to each of us to determine for ourselves (ideally with the guidance of our teachers) whether solo practice is a help or a hindrance. For me, a bit of practice at home seems to work, as long as I’m conscious about it. This is getting long so one more random bit: during Wednesday’s class, Brienne ran all the across-the-floor stuff quite beautifully, and I found that really helpful (not that I managed to get my crap together during class). She has a very graceful, athletic, bounding style, and it’s been handy to be able to picture how she performed our choreography so that I can use it as a model. Pretty cool stuff. Oh, one really last random bit: I managed to actually watch my mouth (thanks, Jim!) a bit during this class. I did catch myself making faces from time to time. Whenever that happened, I made myself smile***, which has the rather magical effect of loosening everything else up along with my face. Good to know. *I re-learned, yet again, about the importance of being solid and connected from the ground up. I’m guessing that the large muscles in the thighs that do a lot of that work were still recovering from the run, as well, which probably didn’t help. **I was sort of hyper-spotting; snapping my neck around in advance of my turn. This throws everything off and makes for a messy finish. ***Because you have to do something. Denis and I routinely debate the whole, “Smile, you’re performing!” idea — he thinks dancers should basically smile all the time; I think they should smile when it’s appropriate to the music they’re interpreting. For me at this juncture, though, attempting a beatific smile is better than just trying not to make faces! Posted on 2014/08/09, in balllet, class notes and tagged ballet, ballet class notes. Bookmark the permalink. 12 Comments. I’m the same way – I learn better when I repeat things A LOT and it’s hard for me to keep my thoughts straight if I’m sitting still. I also agree that 6 lessons a week would be better than practicing at home but it’s not in the budget. It’s good to hear that it’s not just me! One of the things I loved about class at the Joffrey in Chicago was that it ran 1.5 hours, so there was more time for repetition. It’s amazing how much difference that 15 – 30 minutes makes, even! Edited fire typoes. Silly phone! Is Essentials the class that teaches the basics, like a preparation for Beginner Ballet? If so, then it should totally be extended, to have enough time for repetition and for all the pauses in between when the teacher stops to explain stuff. If anything, more time is needed than for a class without explanation, in my opinion. You’ve got it spot on. I can say with confidence that a longer class would really help Denis get the movements down. Right now, Baller Essentials is only 1 hour; even an extra 15 minutes would make a big difference. Do you help him practice at home? Pas de bouree can be tricky for a beginner. It was one of those things that I practiced obsessively – and in slow motion – until my muscle memory made sense of it before my conscious mind did. I’m sure it’s helping his ballet skills improve faster having you tutor him at home. One more thing – I really think that those of us who think best while moving tend to be drawn to dance. I would love to research that idea someday! I think you’re definitely on to something with that theory! I think you’re exactly right about the way our feet change with ballet training. The foot changes are pretty remarkable, aren’t they? Somehow, as a kid, I was never really aware how much dancing shapes the feet. I think I just took my feet for granted. Somehow, it never occurred to me that, like every other part of the body, they would change according to use. One of my dance teachers in high school mentioned that she lost something like 1.5 shoe sizes when her feet “developed an arch!” I haven’t lost that much, but I would definitely say that, length-wise, I’ve probably lost about half a size.